Wishing all my Malay friends, Selamat Hair Raya Aidilfitri, Maaf, Zahir & Batin. Drive safe, bro. 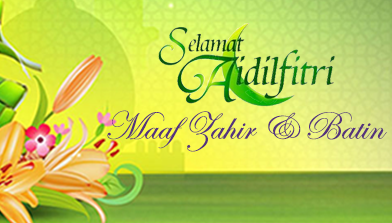 Wishing all my Malay friends, Selamat Hari Raya Aidilfitri, Maaf, Zahir & Batin. Drive safe, bro. I am looking forward to meet up with all of you soon when you are back from your respective kampung.